MUFF WIGGLER :: View topic - Euro sequencer? 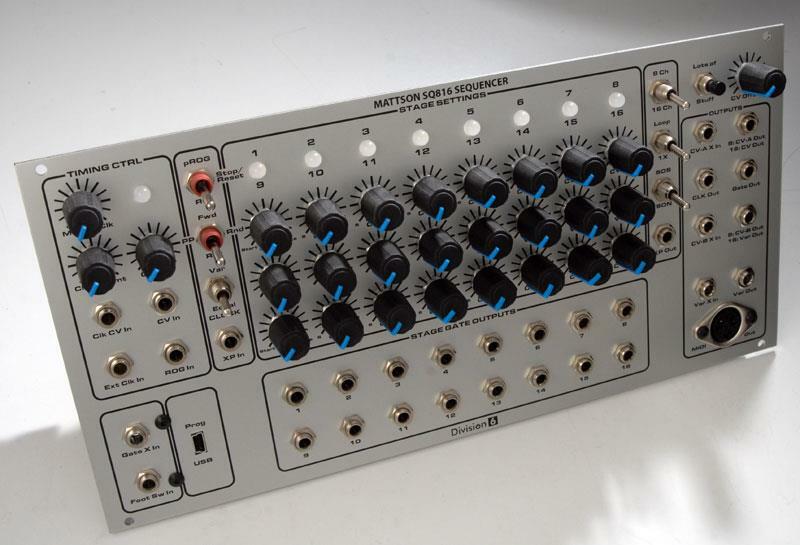 Hi George - I just noticed on Ken Macbeth's facebook page that you popped into one of the conversations and mentioned a "Euro version" of your sequencer. That sounds great! Do you have any teaser pictures for us? Yep, that's on Matrixsynth too but it looks like standard MMM format. The mention of Euro format isn't something I had heard before though. I've rehashed this thing and ran out of board space to build it using discreet logic IC's. So, I scrapped it and went with a PIC. By doing so, I've gone nuts coming up with all sorts of weird "features" to blow everybody away. But, what do I know about sequencers? I did fill the 56th hole in my matrix (got rid of my logo...damn) and moved some things around to make it more user intuitive. Took some stuff off the panel that can be accomplished through software and added a few things. I don't have time to learn a different manufacturers chip architecture so, I've incorporated the help of my little brother Scott Rise of Division-6 to do the programming since, he's good at it and familiar with the architecture. After all, he designed my MIDI/CV. I couldn't fit everything on there. 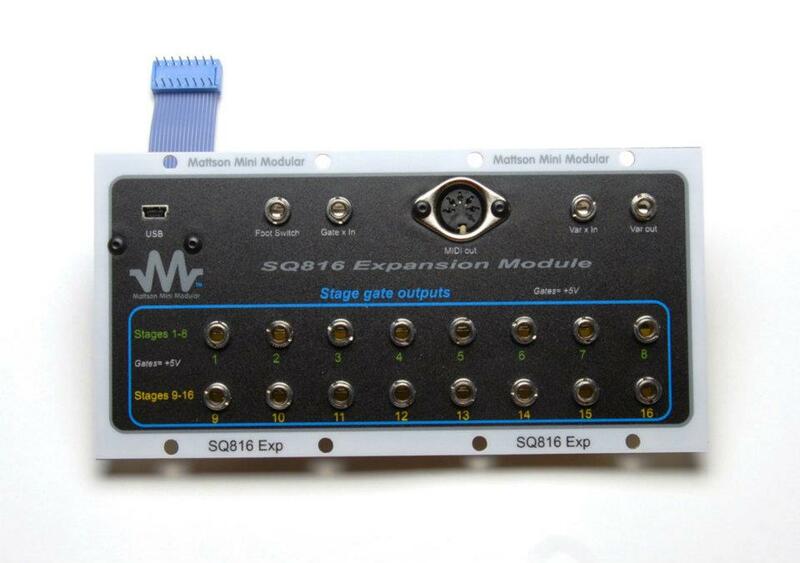 So, I will have a 2-wide expansion module available separately to compliment it that gives a variety of some additional I/O for multiple system interface, 16 individual gate outputs and a Note on/Note off/Note value MIDI output. There will also be a USB port for upgrading the software from my site. That said. Scott and I have been working on this hard for the past month and still working on nit-picky little details. 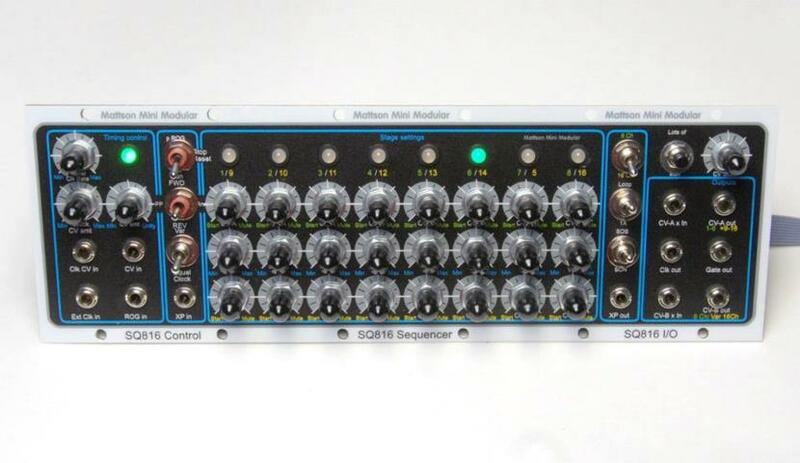 But, since we're working on it together, Scott will be manufacturing it as a combined sequencer/expansion board as the Mattson sequencer under his Division-6 label. Since my panels are so small, it gave us extra room on the bottom of the Euro panel to just add the expansion board. I'll be manufacturing that same 52HP as a stand alone system by slapping my graphic on top of the Euro panel and making a nice box with a power entry port on the back. I'm thinking of walnut. I've designed this so that it will take +/- 15V or +/-12V or, essentially, anything to +/- 7V. The only difference it makes is the gate output level. It will be about a volt less than the PSU voltage. Everything else won't care. OK. There you go. That's all I know. I'll be damned, I didn't know Matrix posted that....Cool. That all sounds great - looking forward to seeing the finished product! I posted some preliminary info and some graphic layouts on my WIKI. The "stand-alone" panel is the size and pattern of the Euro version. Scott hasn't drawn up a panel yet. So, you'll have to look at my version with my graphics to get a layout concept. Well, could have said "multi-function button" but, "Lots of Stuff" works and fits better. 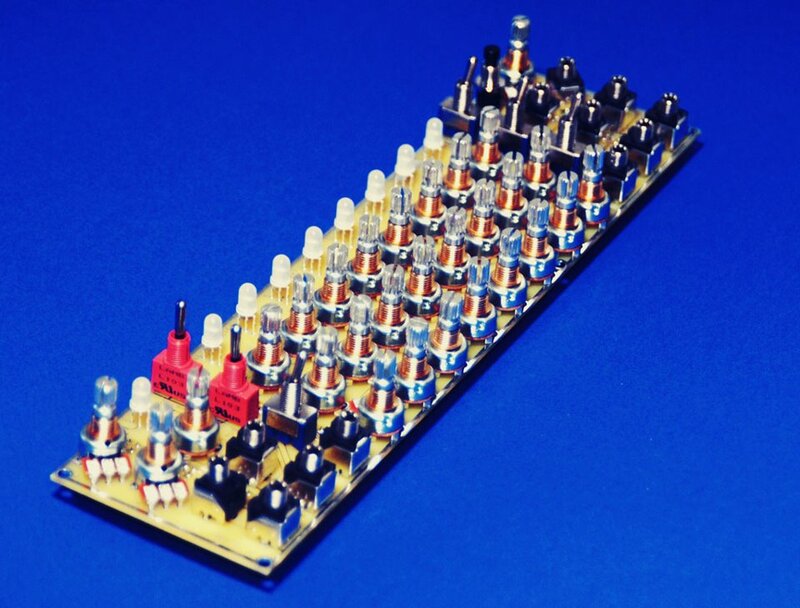 Scott just posted a pic of our prototype panel board on FB. So, I thought I'd post the pic here. While Scott and I are working on this. I've been trying to figure out how to offer a DIY version. So far, I don't have the space for adding connectors for wire kits but, it does connect to the panel board through qty 5, 20-pin headers. I was thinking that for the not-so-faint-of-heart DIY'ers, I could provide 5 ribbon cables that connect to those that can wire up to their panel components of choice. Definitely wouldn't be a beginner project. Finishing up the programming and debugging. Scott is estimating a July release date if his typing fingers hold out. Btw, even with some of the features not programmed yet, I've been having a ball running this through its paces. Just posted a couple of demos of this thing in action while testing it out. I'm just goofing with a couple of the features. The running mute. Which really added more dynamic ability than I was expecting. And, the Ping-Pong/ Random modes. Primarily to check to ensure that returning to ping-pong from random enters Ping-pong at the point and direction it was launched from when entering random mode. Scott and I also have launched a pre-order campaign. ~5% pre-order discount with free domestic shipping. We've both listed both of our versions on each others' carts. Depending on the pre-orders and outside vendor timing. We expect to be shipping sometime in September. Very, very cool. Are you still aiming for a DIY option? But, it would be an "advanced" project compared to what I usually do. Since there's 56 panel components on the panel. I made a panel board to mate with the main board. I really didn't want to make and solder wiring to 56 components. 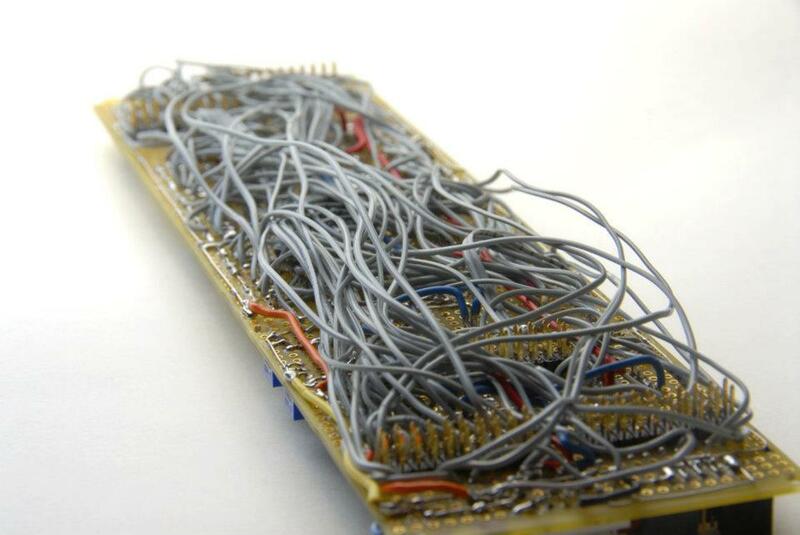 There are qty 5, 20-pin headers connecting the two. I picked up some 20 pin sockets and some ribbon cable that could be connected to the headers and run to the panel components of choice. But, it will take time and there will be some panel component-to-panel component wiring to do. So, a bit more complex and meticulous. The expansion module is all on one board, electronics and panel components. at least the stage gates are. the other jacks/MIDI out and USB are wired through connectors. 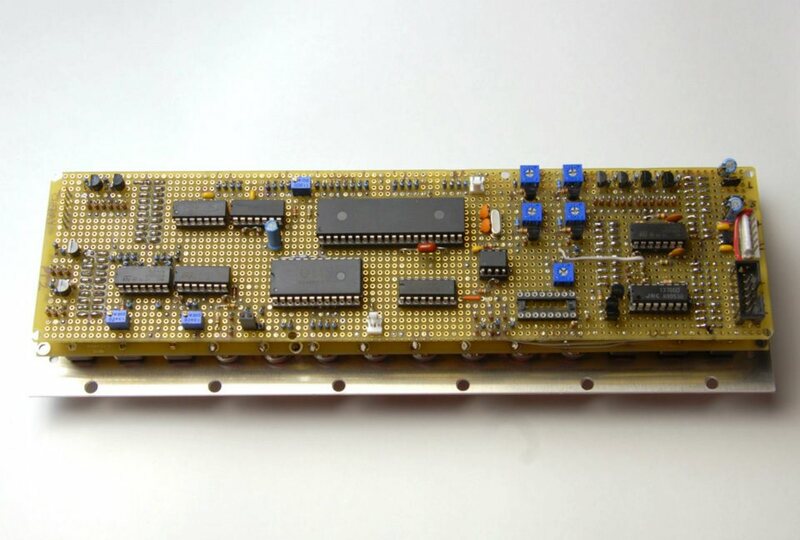 The entire assembly connects to the main board with a 16P ribbon cable. But, the USB and the MIDI out interface connector are also on the main board and accessible on the board for those who don't pick up the expansion module. I "could" do an expansion board without the jacks for the DIY guys but, I'm not sure how I'd test it before shipping....yet. Let me get the main systems done first. then, I'll gravitate toward the DIY version. Short answer...Yes, and sorta no. At least not in my usual style. John L. Rice just emailed me a link. The timing is pretty appropriate. I told him to leave it up. Other than not shaving, not rehearsing and the video consisting of me being me, it's rather informative. cool video! thanks for making it available. many interesting features. I was testing two prototypes sync'd together and running them in Ping Pong mode with the foot switch connected to both. When I tapped the foot switch, both would go into random mode until I tapped the foot switch again. Jason Stiles was there and grabbed this on his cell phone while I was "working"
It was posted around the net a week ago but, I spaced out putting it here.